Located in the southeast of the Zhoushan Islands, Taohua Island has a population of about 11,500 in an area of 41.7 square meters. 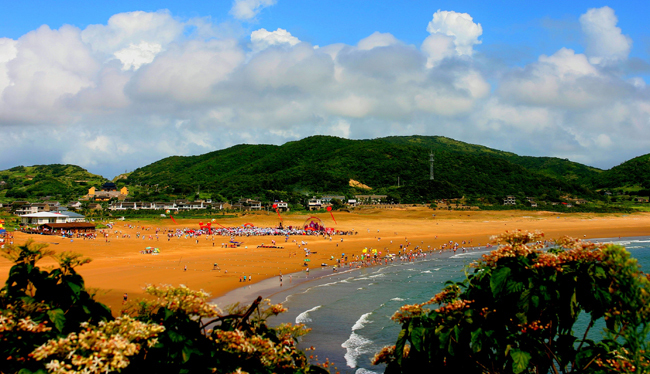 It is home to the highest mountain in the Zhoushan Islands, Mount Anqi. Abundant with colorful natural and humanistic sights, the island consists of six major scenic spots, forming three travel routes featuring martial arts, Buddhism and Taoism. In ancient times, Taohua Island was called Mount Baiyun, which means "a mountain surrounded with clouds". In the Qin Dynasty (221-206BC), a Taoist priest named An Qisheng refused to obey the imperial’s edict and fled to this island, spending a secluded life, cultivating himself with Taoist doctrine and refining an elixir of immortality. One day he got drunk and splashed ink at rocks, and images like peach blossoms (Taohua in Chinese) came into being. This is why they are named Taohua Rock and Taohua Island.